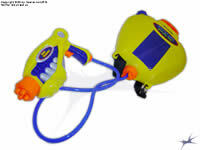 Below are listed information known about some of the biggest, largest, most powerful and/or greatest capacity known for released water guns and water blasters released to the consumer market. Information below is given to the best of our current knowledge, but will be updated as additional information becomes available. The younger brother of the original Super Soaker CPS3000, the Super Soaker CPS3200 holds just a touch more water (8900mL total compared to 8850mL for the CPS3000). 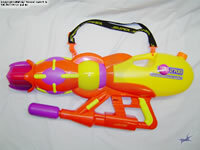 With an 8L backpack and nearly a litre in the firing chamber, this water blaster holds more water than any previous and any water blaster since. The Super Soaker CPS2700 can hold a whopping 4L (133.33 oz.) of water in its reservoir as well as an additional 800mL (26.7 oz.) in its pressure chamber. 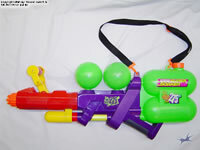 One can imagine that this water blaster gets particularly heavy when completely filled. The Super Soaker SS300 can hold a whopping 6.5L (216.7 oz.) of water in its reservoir as well as an additional 1500mL (50 oz.) in its pressure chambers. 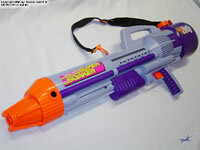 This beast-of-a-soaker once truly dominated the water warfare field whenever it was brought out. 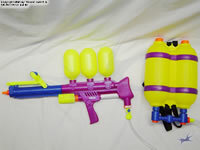 The Super Soaker XXP275 remains the largest single-piece water blaster even manufactured. Sporting dual nozzles and a 2700mL (90oz.) 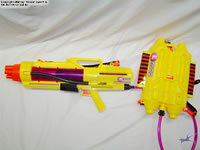 reservoir, this blaster could outsoak and outlast most other water guns during its time. The Water Warriors HydraPak (previously also known as the AquaPak) holds a whopping 4.5L (150oz.) of pressurized water when it is fully pumped. Because of this, this water blaster can keep on soaking for many minutes on its lowest setting.